How to Solve "Audio or Video Cannot Be Played on ipad mini" Symptoms? With the debut of Apple's iPad Mini, we have to admit that iPad mini does stand out in comparison with its latest rival mini-tablets: Despite having a larger screen than those of its nearest rivals like Google's Nexus 7 and Amazon's Kindle Fire HD, the new iPad mini is lighter and about half as thick as either one. Better yet, despite its lighter weight, it feels much more solid. iPad mini only supports to play audio files which are in AAC, MP3, Apple Lossless, AIFF, and WAV. If you try to play any other audio formats like FLAC, OGG, WMA, QCP, APE, AMR, RA, SHN, MPC, VOC and etc, iPad mini will refuse to import and play. iPad mini only recognizes video files which are in MP4, M4V and MOV. If you try to import and play movies on iPad mini in the following video formats like AVI, MKV, WMV, WTV, FLV, F4V, SWF, MPG, VOB, MXF, ASF, RMVB, WebM, BIK, MVI, AVCHD and etc, it will end in fail. 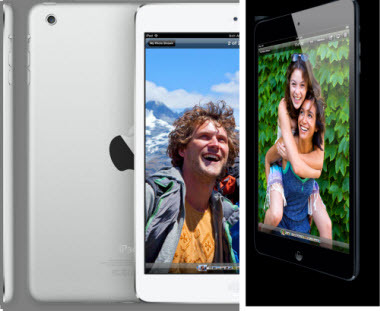 Even iPad mini supported video or audio format like MP4, MOV, M4V still cannot be copied to the iPad mini sometimes because of the difference in resolution, bit rate, aspect ratio, and size audio codec with the requested specifications of iPad mini. To solve "audio or video cannot be played on iPad mini" issue, a recommended solution is to convert audio or video to iPad mini supported format. 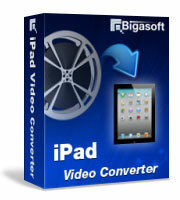 Bigasoft iPad Video Converter is just the ideal iPad mini Converter. Acting as iPad mini Video Converter, it can fast convert all kinds of movies in whatever video formats to iPad mini supported video format. Working as iPad mini Audio Converter, it enables to convert various audio formats to iPad mini friendly audio format or convert movies to iPad mini supported music format. The following is a step by step guide on how to convert movies to iPad mini compatible video format or audio format; it also applies to converting audio to iPad mini supported music format. 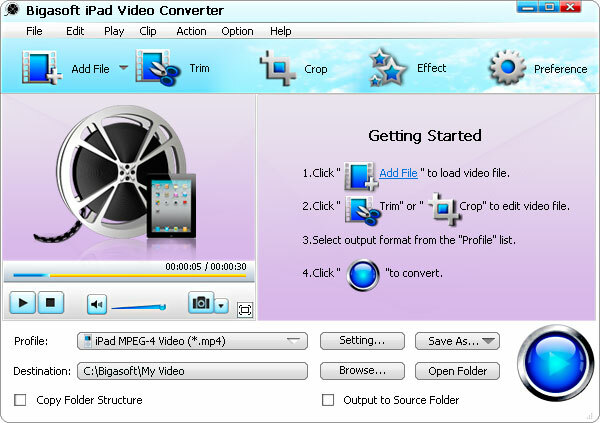 Free download the powerful Audio/Video Converter for iPad mini - Bigasoft iPad Video Converter ( for Windows, for Mac), install and run it, the following interface will pop up. Click "Add File" button to add the movies files you want to play on iPad mini whatever it is in WMV, AVI, MPEG, MKV, WTV, DVR, FLV, F4V, SWF, 3GP,VOB, MXF, MVI, ASF, RMVB,RM, WebM, BIK,AVCHD, MTS, M2T, M2TS, MOD, MP4, MOV, M4V, TOD, and etc. Tips: This powerful iPad mini Converter also supports importing and converting audio files whatever it is in WMA, FLAC, OGG, QCP, AMB,AMR, MPC, VP8, APE, AC3, SHN, VOC, CUE and so on. Click the "Profile" drop-down button to select iPad mini H.264 video(*.mp4) from the "iPad" category. To convert video to iPad support audio format, select MP3, M4A, or AIFF as output format the "General Audio" category. Click the "Convert" button to start converting videos to iPad mini compatible video or audio format; it will be finished with fast conversion speed and high output quality. It is just easy to solve "video or audio files can be copied to this iPad mini or cannot be played on this ipad mini" symptoms with the above iPad mini Converter and step by step guide. This guide also applies to solve "cannot be played on this ipad 4, iPad 3, iPad 2, iPad, iPod, iPhone" issue.